Metal Detecting In Rhode Island? Metal detecting in Rhode Island follows the Antiquities Act of 1906. Click on the link below for the explanation and some of the problems people face who break this law. Be sure and read through the entire page. Even though the Antiquities Act does not specifically mention "metal detecting", you need to understand what this law says about digging artifacts. Pay particular attention to the section of stories I have linked to that have been related to me about what happens when individuals break these laws. The above law is the grand-daddy of laws when it comes to digging artifacts. 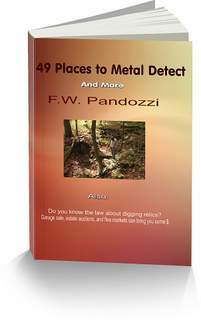 However, if you are metal detecting in Rhode Island there are a few more laws you need to be aware of. These laws follow the Antiquities Act. To make this easy, just remember not to dig any item that is more than 100 years old. Remember, we are talking about State lands. If you want to detect on private property, then be sure you get written permission from the landowner. And respect the property owners land. If you are respectful, and act professional, you may end up getting more references from the property owners for places to detect. They do tell their friends, families, and neighbors. For detecting in Rhode Island, town, village and city parks, you'll need to check with those local officials. At this link are some stories of others who have broke the laws. Yes the laws are disturbing. And every so often the beaurcrats, along with some archaeologists, try and pass another law. It's frustrating and some in the metal detecting hobby have quit because of this. If you are thinking of doing the same, don't do it. By quitting, it gives the power to those outside of the hobby who would like no more than to see the hobby controlled by government, or abolished completely. If you quit, they win. I was the first to film a reality, metal detecting, TV series. And when the show first appeared live in New York, the archaeologists went ballistic. Find out why. Have you been metal detecting in Rhode Island ghost towns? Be careful, don't break the law!